There were a few things that got Owen Quade through his multiple combat tours. One was the dream of riding a custom motorcycle on a winding mountain road. The former Marine had finally managed to complete that goal, and along the way he'd gained his own bike shop and the mechanic to go with it. She was a rare beauty, and he wasn't talking about his bike either. Prue Whitaker preferred working on engines over rubbing shoulders with people, and that included her boss. She'd learned the hard way that men weren't as reliable as the hogs she could repair and she kept her distance from those who didn't feel the same way. She'd been successful until she'd recently shared a scorching kiss with Owen. One phone call had changed everything. A catastrophic event is on the verge of occurring, forcing them to pack up and leave everything behind. Prue is driven to trust Owen, who's given his word that he can get her to safety. Through the endless days of darkness, passion, and intrigue await them as they make their way through ashes and into the flames of tomorrow. ©2015 Kennedy Layne (P)2017 Audible, Inc. 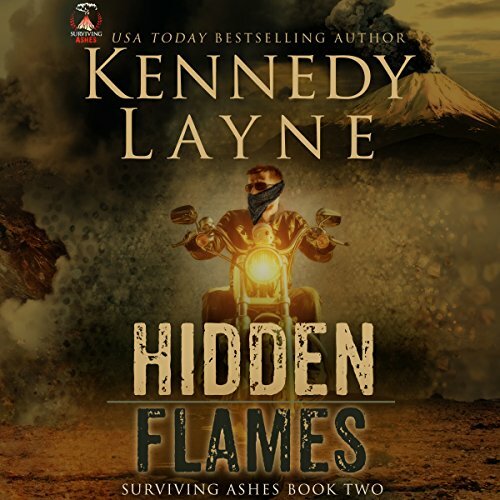 This series by Kennedy Layne rocks! Her plots are exciting and imaginative and the characters are interesting. It's really hard to put the book down when you need to do other things! I can't wait for the next book in the Surviving Ashes series. Loved it! I'm off to the third book. Great series! Rock Engle is spot on as narrator.